Courtesy of Raul Montes Jr. 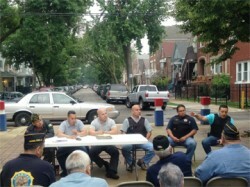 Residents of Little Village gathered together over the weekend with hope to bring about more resources to combat gang violence. The surge of gang violence and gang shootings in the last few weeks in the Little Village community has people feeling like hostages and extremely petrified in their stagnant community. Since June there have been at least eleven shootings and one homicide in the western part of the community reported. What precipitates this community forum with residents and police is the influx in gang violence and crime where this urban decay is spilling into neighboring western suburbs like the Town of Cicero, Berwyn, Stickney and Forest View. Many neighbors and local business owners have worked diligently for years in an effort to get the attention of our local, state and federal public officials to bring resources for more violence prevention initiatives, surveillance “Blue Light” cameras and more police presence to help combat the gang violence and have been unsuccessful. One must understand the sociological aspects of this destitute community and how it’s been put on a back burner.